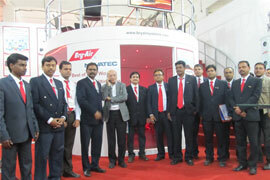 Bry-Air, a distinguished player in the field of Drying, Conveying & Blending, has participated in PlastIndia 2012. The exhibition was held at Pragati Maidan, New Delhi from February 1-6, 2012. Bry-Air was present at H-1, C4. 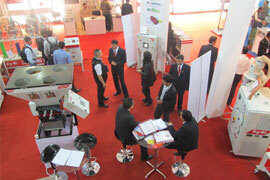 Bry-Air, a distinguished player in the field of Drying, Conveying & Blending, demonstrated ‘Game-Changing technology’ in recently concluded PlastIndia 2012. Bry-Air has introduced an innovative, moisture measurement technology driven product, which can determine core moisture content independent of density, colour and surface structure of the measured resin. Product was very much appreciated by Plastic processors community. For years, resin drying has been all about circulating -40° dew point dehumidified air to the drying hopper for a prescribed time. But dew point only measures the air moisture. The only way to verify that the resin is not under-dried or over-dried has been to test it off line and then adjust the process. Now, all that has changed, the dehumidified dryer and Bry-Scan can control real on-line resin moisture automatically. Apart from Bry-Scan-100, another new product that was introduced by Bry-Air was Membrane Dryer. Membrane dryer has been introduced by Bry-Air with the help of Novatec, USA. The membrane used in membrane dryer is being used by US Navy since 1991. Gravimetric Blending Unit also caught eyes of many plastic processors. PLASTINDIA 2012 has been making significant efforts to create new opportunities for all the major growing economies to be represented. Bry-Air has been engaged with plastic industry for more than four decades. The Indian Plastics Industry is now well set to meet the global challenges. The Indian Plastics Industry has been growing at a rate of 12% over the years and with its true potential harnessed, it is all set to reach the 12.5 MMT by consumption making India the 3rd largest consumer of plastics by 2012. Packaging, Electronics, Telecommunication, Infrastructure, Transportation, Healthcare and Consumer Durables are fast growing sectors of Indian economy offering growth for plastics consumption. Bry-Air showcased live demonstration of the most modern machines, technologies and their applications.